When you’re buying kitchen gadgets you’re probably doing so to make your life easier and choosing them based on long term durability. Well if you live in an area where the water is hard then you may find that your electric kettles don’t last too long and your tea or coffee doesn’t taste great. That’s because boiling hard water causes scale formations that either affect the taste of your brew or damage your kettle over time. The best electric kettle for hard water can prevent both these from happening and our reviews will help you find one just right for you. 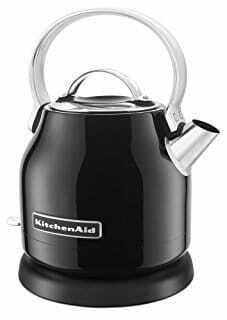 What is the Best Kettle for Limescale Removal? The term “hard” water originated from the fact that it is hard to wash anything in it. The reason for this property is the high presence of dissolved calcium and magnesium compounds as well as some metallic elements. Hardness prevents soaps and detergents from lathering so you tend to use them in greater quantities. Water hardness also causes soap scum to build up, which necessitates extra cleaning in the bathroom and kitchen. Your skin and hair will start to feel the effects, with the former feeling dry and itchy and the latter becoming dry, dull and tangled. Dishes and glassware get spots, and clothes become stiff and lose their brightness. When water evaporates, either slowly or quickly, a hard white deposit starts to form on faucets and appliances parts. This is called limescale and it causes damage to water boilers, washing machines, dishwashers, kettles, and cooking pans over time, as it forms very quickly over heating elements, causing them to fail. It also raises energy costs, as the heating elements work less efficiently. The Water Quality Association of America establishes the degree of water hardness and it is measured in milligrams per litre or grains per gallon. Less than 17 mg/L is considered soft, while over 180 is very hard water. If you live in an area with moderately hard to very hard water then you will have to contend with the above problems in your home. The pace of damage depends on how bad the water quality is. To prevent this, you can either install a water softener for the entire house, or for separate water inlets, or just use filters for specific faucets and appliance inlets. If you want to boil water for your tea or coffee or fill the coffee machine’s reservoir, you’re better off using filtered water so that you don’t have to clean your tea kettle or coffee machine too often. This will also ensure that your coffee or tea tastes clean and not metallic. If you don’t use a water filter, then you should at least get an electric tea kettle with a filter that blocks limescale from getting into your brew from the kettle. The most common filter is the kind that sits just behind the pouring spout. Any loose scales the form from the water boiling will be blocked by this mesh filter. What is left behind can be scrubbed clean after the kettle has cooled. The filter should be removable for periodic cleaning because it is also susceptible to scale formation and will slow down the water flow until it stops completely. These days an electric kettle with concealed heating element is common because even slightly hard water causes quick buildup of limescale on the element, which is difficult to clean regularly and therefore causes the element to fail quickly. Modern electric kettles will have the heating element sealed and hidden underneath the base and all you have to clean is the smooth interior. In order to make the cleaning process easier, the opening on the top of the kettle should be large enough for your hand to pass through and manoeuvre around while scrubbing. We’ll show you how to descale and clean your kettle later in this article but for now let’s review our top picks. The newest model of the popular Cuisinart CPK-17 PerfecTemp has recently had a spate of complaints about leakage problems and a flimsy lid along with the opening not being wide enough to fit your hand in. However, if you like to brew different types of teas and want to be able to control the temperature of the water, then instead choose the Epica 6-Temperature Variable Stainless Steel Cordless Electric Kettle. It is not just for boiling water and if you live in a hard water area, then the opening at the top is wide enough to let you reach in to clean. Because it has the ability to be programmed to heat water to any of 6 different presets, you can get the perfect temperature for specific teas that you brew. That’s why we also recommend it as one of the best electric kettles with temperature control. This 1500 watt cordless kettle sits on a 360 degree swivel power base to make it easy to serve your guests with and also to take it to the sink to fill it up from the top. The hinged lid pops up and away at just the press of its button that’s set on the lid. The kettle has a 7 cup capacity and the water level marked window behind the handle is easy reading to let you know how much water is inside. You can keep it off the base for up to 2 minutes if you want it to remember what it was programmed to and restart heating or continue in the warm mode when you bring it back. The heating element is hidden inside the base below and the kettle is all stainless steel, making it easy to clean inside. The preset buttons with temperature readings are set on the outside of the handle. You first select one of the presets and then you press “Set” to start heating the water. When the water reaches the required temperature, it automatically shuts off, though it doesn’t alert you when it does. It does have a 120 minute keep warm button that you can press if you want to wait a bit before having your first cup or if you want to pour another cup of tea after your first one without heating it up again. There is a removable and washable scale filter that slides into a slot just behind the pouring spout. The kettle also features boil dry protection with auto safety shut off in case you forget to turn it off. Other than this being a good programmable kettle to use with hard water, it is also quite fast to reach full boil. Be careful around it though, as it gets very hot on the outside since the body is stainless steel. However, the handle is heat-resistant so you can lift it without worry. The 1500 watt Breville BKE820XL Variable-Temperature 1.8-Liter Kettle is fairly similar to the Epica above in operation but different in style and more expensive. Its updated model has garnered rave reviews, has a new scale filter that’s set behind the spout, and the old leaking issue has been fixed. This too allows you to control the temperature and comes with 5 presets for you to do so. The boil dry auto-shut off protection engages and emits a subtle beep when it reaches the selected temperature. You can press the Keep Warm button to allow it to stay hot for 20 minutes more if needed. The control panel is on the front of the base of the kettle instead of the handle, so you can’t accidentally push a button when you lift the kettle. The water level window is set on the front and back of the kettle, so it’s much easier to see how much water is left inside, whether you’re right handed or left handed. The lid opening button is found on the lid itself and the opening is wide enough to allow you to clean the stainless steel interior easily. While the kettle is set in a 360 degree rotation base, it will not remember your previous setting if you remove the kettle and bring it back after serving, but selecting the required button again is not really a big deal. If you’re looking for a small electric kettle that’s just enough for a two people or small enough for travel, then the 1 litre T-fal BF6138 Balanced Living Electric Kettle is a good pick. You never know what the quality of water is away from home but if you like to make your own tea in your room and there is no kettle there, you may as well take a small kettle that has a scale filter. This model also features temperature control, but by an indicator knob instead of specific preset buttons, so you have to figure out the best setting by trial and error in the beginning for your favorite types of teas. This kettle is also cordless with a swivel power base and auto shut off. It is very powerful for such a small kettle, as it’s rated at 1,750 watts of powe and should boil 1 cup of water in as little as 90 seconds. The hinged lid opens by the press of a button on the handle, and to close it locks into place. The heating element is concealed inside the bottom of the kettle. It has a water level indicator window on the front and to one side. The scale filter here is a bit different and is designed like a small basket that fits into the pouring spout. It is removable for cleaning. If it becomes too worn out after frequent use, replacement stainless steel filters are available on the T-fal website. If you don’t need the temperature control feature and don’t like the modern stylings of the other kettles here, the beautiful retro-styled KitchenAid KEK1222 1.25-Liter Electric Kettle that’s available in a variety of colors should please you and match your kitchen decor. Its 1.25 litre capacity is a bit smaller than the above two but it is just as powerful at 1500 watts. It features an LED indicator right next to the on and off lever switch at the bottom of the kettle which sits on a 360 degree swivel power base. It features a stainless steel body, smooth top aluminum handle, removable lid with handle and removable limescale filter. The handle does not get hot even when the water reaches boiling. The body does get hot but the bottom is insulated enough that it gets just mildly hot and can be placed directly on a countertop. While this kettle cannot be controlled for temperature, it does have an auto shut off when it reaches full boil. It is easy to reach your hand in from the top to clean. One complaint has been that rust spots tend to form in parts inside. However, those that dry the kettle completely after use have not had this problem. If all you want is to boil water quickly and have it shut off automatically when done, then the Brewberry Cordless Electric Kettle 1.7l, Stainless Steel Tea Kettle is a good value electric kettle. 1.7 litres of water will reach a rolling boil in 3 minutes and you can lift the kettle off the base completely to take it elsewhere to pour. The easy pour spout comes with a removable scale filter and the opening on top is very wide and easy to fill water through as well as reach in to clean. It opens via a large hinged lid by the press of a button on the top of the handle. A large water level viewing window is set right in front. While the handle stays cool throughout, the body gets very hot so care needs to be taken if there are kids around. Not only does cleaning and descaling your electric kettle regularly extend the life of it but it also reduces your energy bill. Before we show you how to clean or descale a kettle, you should try to prevent limescale from forming to quickly. If you don’t use all the water in the kettle in one shot, don’t leave the remaining amount to sit inside for too long, as this is enough to cause a slow build up. Empty the kettle as soon as possible and wipe the interior dry with a cloth. Taking this precaution will require less frequent descaling of your electric kettle. When you do notice a while layer forming around inside, and particularly the bottom, of the kettle, it’s time to descale. The best limescale remover is also completely natural and safe to use. You take equal parts of water and white vinegar and fill the kettle up to half or three fourths its capacity. Close the lid, turn it on and let the mixture boil. Let it auto-shut off or you can switch it off when you see it boiling. Let it sit for 15 minutes, then unplug the kettle and pour out the solution. You can scrub the inside now to remove any scales still attached to the bottom and the walls. If you see some that’s not coming off easily, then use a little baking soda to help. Once done, rinse the inside with fresh water several times until the smell of vinegar leaves. Wipe the inside with a dry cloth and let it air dry before boiling water again to remove all traces of vinegar. You don’t want your tea tasting sour, do you? Also clean the scale filter periodically. To do this, leave it in a cup of vinegar for a few minutes to loosen the scales up and then scrub it by hand with a scrubbing pad and rinse under a tap. The vinegar solution works best if you haven’t allowed too much buildup to take place. If you have, then it probably won’t be enough to completely descale the kettle. In that case, you should use an activated kettle descaler like Urnex Liquid Dezcal. It is completely safe, non-toxic and biodegradable and will remove even the thickest layer of limescale from all kitchen appliances. ← Cuisinart TOA-60 Vs Breville BOV900BSS – Which Air Fryer Toaster Oven is Better?